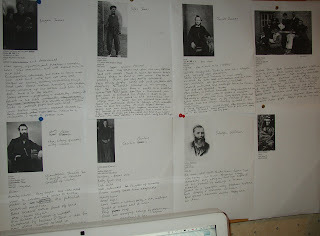 The character thumbnails of my Patagonia book have been re-instated above my desk. I have a duplicate set in the shed for when I work in there. I am trying to finish the editing before Christmas but it is going very slowly. So, in order to motivate myself, I am going to record my progress on this blog. I am so excited that you are in the throes of another great book and look forward to following your progress with you. Hi Kay! It's the same old book, I'm afraid - but this may be the final furlong, perhaps! wow! that is really interesting and cool to see how you do that. I have to agree with susangalique's comment about how interesting it is to see your character thumbnails. The process of writing is different for everyone, of course, by I don't think most people get a chance to see how writers work things up on a practical level. When it comes to writing fiction, I don't have a character until I have a name. I pour through baby name books, plus have a notebook of interesting last names I've collected, in order to find the proper name for a character. Then I work up some life details (birth date, description, basic back story) on index cards. I've not used pictures, though. Ali - maybe a little of Megan - and maybe a little Miriam - but definitely not any Cecilia! Actually, thinking about it, you're much more like Miriam. Miriam wears her skirts short so she can move around more! Thanks S, and yes, Mary, as you say, I am sure every writer is different. Interesting what you say about the importance of names. For me, they are not quite as important, I think - the character tends to come first, and the name only later - but having said that the name has to fit! Mine have all had several, but I think I am going to stick with these now. That is Yelue, Jem - my Tehuelche shaman. I am ignoring his chapters for the moment, but looking forward to revisiting him soon. I am very fond of Yelue.